For the German Unteroffizier in the Wehrmacht, see Gustav Bergmann (soldier). Gustav Bergmann (May 4, 1906 – April 21, 1987) was an Austrian-born American philosopher. He studied at the University of Vienna and was a member of the Vienna Circle. In the United States, he was a professor of philosophy and psychology at the University of Iowa. Bergmann was born in Vienna, Austria-Hungary. 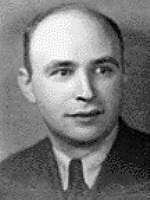 He earned his Ph.D. in mathematics at the University of Vienna in 1928. His dissertation, directed by Walther Mayer, was titled Zwei Beiträge zur mehrdimensionalen Differentialgeometrie. While studying for his doctorate, he was invited to join the Vienna Circle, a group of philosophers, mathematicians, scientists, and others committed to a scientific worldview under the name of logical positivism. In 1930–31, he worked with Albert Einstein in Berlin. Unable as a Jew to find academic employment, Bergmann obtained a law degree from the University of Vienna in 1935, and practiced corporation law until he and his family fled to the United States in 1938. Settling at the University of Iowa in Iowa City in 1939, Bergmann eventually became professor of both philosophy and psychology. He died in Iowa City. The Metaphysics of Logical Positivism New York: Longmans, Green & Co. 1954. Second edition: Madison, University of Wisconsin Press, 1967. Philosophy of Science Madison: University of Wisconsin Press 1957. Meaning and Existence Madison: University of Wisconsin Press 1959. Logic and Reality Madison: University of Wisconsin Press 1964. Realism: A Critique of Brentano and Meinong Madison: University of Wisconsin Press 1967. New Foundations of Ontology Madison: University of Wisconsin Press 1992. Edited by William Heald. Collected Works. Vol I. II. Frankfurt am Main: Ontos Verlag 2003. Ontology and Analysis: Essays and Recollections about Gustav Bergmann, edited by Laird Addis, Greg Jesson, and Erwin Tegtmeier, Frankfurt: Ontos Verlag, 2007. Fostering the Ontological Turn: Gustav Bergmann (1906-1987), edited by Rosaria Egidi and Guido Bonino, Frankfurt: Ontos Verlag, 2008. Gustav Bergmann: Phenomenological Realism and Dialectical Ontology, edited by Bruno Langlet and Jean-Maurice Monnoyer, Frankfurt: Ontos Verlag, 2009. The Ontological Turn: Studies in the Philosophy of Gustav Bergmann, edited by Moltke Gram and Elmer Klemke, Iowa City: University of Iowa Press, 1974. The Positivist and the Ontologist: Bergmann, Carnap, and Logical Realism, by Herbert Hochberg, Amsterdam: Rodopi, 2001.